Accolade coin is digital reward and application platform for driving the advertising and other industry which gives rewards to others. There are lots of incentive based advertising platform which gives incentive in form of data and some other means. The project aims to become a global reward system, enabling developers and merchants to use the API and give the accolade to their users. 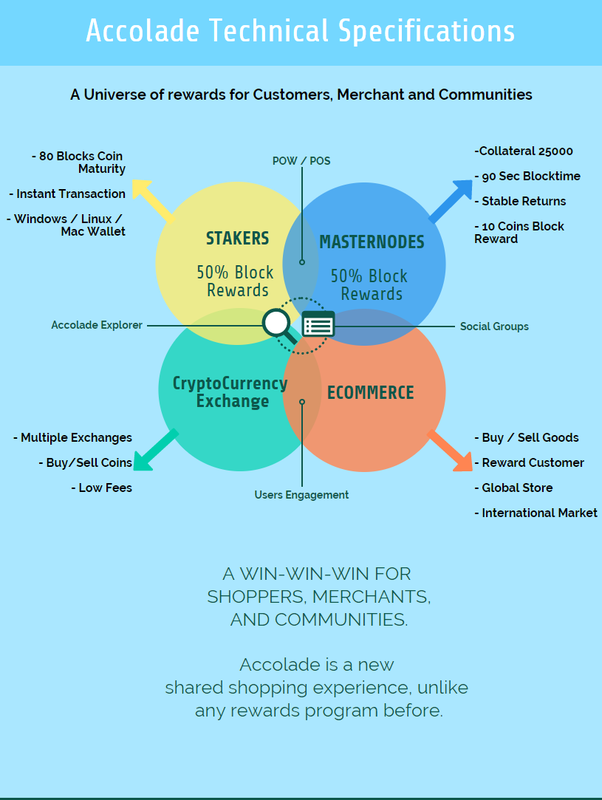 Accolade is an innovative and adaptive new age cryptocurrency available to everyone. It is going to take the lead in cryptocurrency progress and diversity, because it is easy to use and it has the most secure and developing program. With this mission statement we want to show what a Cryptocommunity can do, and that anything is possible. DarkSend is a function that makes anonymous a part of your coins. The parts, once anonymized will then be available only on DarkSend networks and can be exchanged anonymously between wallets. The anonymization of the currency involves a variable cost depending on the volume to be processed and take a long time. You can send funds between accocoin wallets faster thanks to the support of masternodes. The validation of the transaction will therefore be faster. The transaction cost will be higher than a typical transaction to reward the Masternodes that validated the transaction. Masternodes are full nodes, just like in the Bitcoin network, except that they provide a level of service to the network and require collateral to participate. Collateral is never forfeit and is safe while the Masternode is operating. This allows investors to provide a service to the network, earn interest on their investment and reduce the volatility of the currency. To run a Masternode, you're required to have 25000 ACCO and a static IP address. 4) Mobile Wallets – we are working on it. The exact time will be updated. 5) Bounty campaign – campaigns will come soon. 6) Listing in exchanges – we are working on it. The exact time will be updated. - New exchanges. We are planning to add AccoCoin to bigger exchanges, but they have a requirement that we need a bigger Community. So you can help us with it by telling others about AccoCoin. - CoinPayments - cryptocurrency payment platform. We want to add Accocoin, but we need bigger marketcap. It’s not a problem, but it will take some time. We are ready to cooperate with you if you have some good ideas for Accocoin or you can help us in any way. First and foremost we want the Acco Coin to become a most popular crypto currency, that can be used to buy goods and products online. We don’t want this coin to be like other coins, that you can only find in exchanges, and only be used to exchange with bitcoin. Therefore we want to open a marketplace, where you can use Acco coin to buy and sell. We also want to open an exchange for Acco coin, so you can exchange with other coins or fiat currencies. We want to integrate Acco Coin with Woocommerce plugin, so different shop that use it, can accept Acco Coin to sell their goods. We don’t have a precise expected date for our long term plans but we will inform you as we go. Are you serious dev? Mining before launch? Need info about POW and premine. Trade shitcoins to earn more Bitcoin. Read the comments instead of here!!! can you put it on stock.exchange first ? when can we see the coin on stock.exchange? Where I must share my address? In Whatsup Group or I need write PM to dev? I joined Whatsup, sent address, but not received coins. i sent address to the dev and got my coins, he might have gone to bed? who am i going to send eth address to? dev or admin of whatsapp group? when do you think stock.exchange will come?